A comment that is made to me very frequently from people who want to be professional writers is that they want to write, but can’t make themselves sit still long enough. For all of you out there with this problem, I hate to say this, but… If you can’t plant yourself in a chair long enough to work, you’ll never get anything written. Distractions happen. It’s one of the major obstacles of working from home. The Internet makes it even harder to avoid distractions. It’s so easy to hop over to your favorite entertainment website to check the synopsis for the next episode of “Doctor Who”, or to watch the trailer for the next episode of “Grimm”. There are always new Grumpy Cat memes to be read and laughed at. YouTube is filled with time wasting videos of varying lengths to while away the hours. These things will keep you in your chair, but away from your work. Housework needs to be done. The telephone is ringing. The children are clamoring for your attention. Meals need to be planned, prepared and served. The lawn needs to be mowed. You’re drowsy; you want a nap. Take care of day-to-day living things, certainly. At the same time, if you let these things take up every moment of every day, you’ll find yourself in that situation that I’m talking about. You’ll be someone who want to write, but can never find the time. Different things work for different people. Some people need quiet when they write. Others thrive on the energies of public places, or even music concerts. Some people write better during the day. Others are more productive at night. Some people can squeeze in time for a couple of hundred words a day. Others are doing good if they can fit in fifty words a day between household chores, and diaper changes. Find the time and place that works best for you. Get the story down. Do it in fits and starts, bits and pieces if you have to. Worry about putting it in chronological order later. Worry about edits later. For now, just get it down on paper—or word processor, preferably. I’m a critically-acclaimed, bestselling author of over thirty short stories, and nine books. I also work in the comic book and film industries. Do you think all of that was written at one sitting? No one cranks out an entire novel in one day. At least no one cranks out an entire novel worth reading in one day! “Quintana Roo, Yucatan” is the longest book I’ve written to date. The paperback edition (http://www.amazon.com/Quintana-Roo-Yucatan-Scott-Harper/dp/193937801X) is 564-pages-long. From the beginning out of the outlining, to the final, published book was a bit over two years. That’s a lot of work! But if you’re even thinking of writing a book you know that it’s not an easy task. So, even if you can only work in small chunks of time, moments stolen away from daily life and chores, do it. Some people will say that a book wrote itself. No, they don’t write themselves. Sometimes a story will seem to write itself. But you, as the author, need to sit yourself in a chair, and write the book. For those of you out there who want to write, but can’t find the time, take this advice. Make yourself sit and write. You’ll be amazed at what you accomplish! Desirée Lee and I are currently in the midst of co-authoring two books. Recently, we’ve seen a few milestones on one of those. Please keep watching this blog for more on this project. We’ve been keeping the details of this one quiet until it’s ready to go. Hopefully that will be very soon! The response thus far to the casting calls for “Most Likely To” has not been good. We have a few interested actors for the two male roles we’re trying to cast right now. But not one actress has approached us with interest in either of the major female roles. 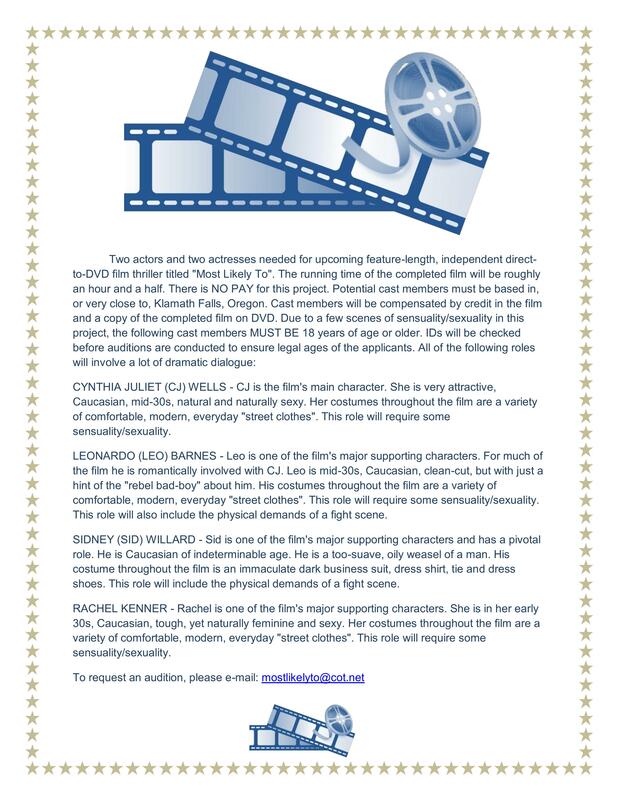 We’re seeking cast members in and around the area of Klamath Falls, Oregon. Please look over the casting ad below. If you’re interested, please let us hear from you. Also, please share this post as much as you’re able. The more potential cast members who see it, the better. The trend I mentioned a while back of international visitors to this website/blog is continuing. I just want to take a moment to thank all of my fans for their continued support. But this post is especially dedicated to my fans living outside the United States of America. Thank you all! Recently I put up a blog post talking about things readers can do to help their favorite authors, and support them on-line—https://scottharpersblog.wordpress.com/2013/05/23/word-of-mouth/. Here’s something else to add to that list—bookmark the website for your favorite author(s). Visit them often from those bookmarks. If it’s a site you visit frequently, set that URL as your homepage. Desirée Lee’s website is http://www.desireelee.com/. Mine is http://www.scottharper.net/. Please bookmark both. Setting one or the other as your homepage would be greatly appreciated, also. Desirée Lee and I recently began writing for “Nuclear Winter Entertainment”. We’re writing one article per week for the site. If you’re in the entertainment business—literature, comic books, TV, film—and would like some free exposure for your work and projects, please contact me. If I’m interested, I can make you and your work the subject of one of my “Nuclear Winter Entertainment” pieces.